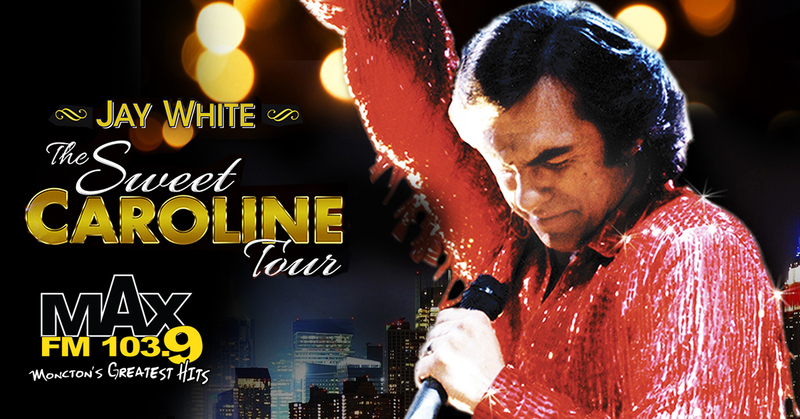 103.9 MAX FM is proud to present The Sweet Caroline Tour; The Musical Journey of Neil Diamond on October 5th at the Capitol Theatre! Las Vegas Headliner Jay White is one of the world’s most convincing recreations of Neil Diamond. Jay White has been paying homage to Neil Diamond for over 25 years. Jay’s every movement, sound and expressions are tributes to the passion and power of the real Diamond, giving new luster to the life of the man and his music. From the moment he hits the stage with Diamond’s favorite “Cherry, Cherry” to the fabulous flag waving finale “Coming To America”, Jay fires the audience with the intensity of his first class illusion. In 1996 and again in 2002 White met Diamond before his Vegas MGM appearances, where Neil told Jay to “keep up the good work” and autographed a photo of the two, signing: “Jay, keep singing, so I can stay home and relax, your friend in music”. If you are a Neil Diamond fan, this show is for you!